In 2009, NASA launched an orbiter around the Moon with the goal of capturing high-resolution images of the surface, including sites explored by Apollo missions. These images of incredible precision also aimed to convince some of the veracity of the Apollo missions. The Lunar Precursor Robotic Program (LPRP) is a completed NASA program designed to launch robotic missions to improve knowledge of the lunar environment. This program also reduces/eliminates risks and improves efficiency by relying on robotic missions. In this context, NASA wanted to achieve a very precise mapping of the Moon, a mission that was entrusted to the Lunar Reconnaissance Orbiter (LRO). It is a satellite placed in lunar orbit to capture high-resolution images of the surface. The launch took place in June 2009. The orbiter is designed and sized to capture and transmit high-resolution images. Each day, the total volume is 461 GB. The complete cartography must generate a volume between 70 and 100 TB. NASA used this orbiter to photograph the sites of Apollo missions and even decided to reduce the altitude of the orbit to improve the accuracy of the images of these sites. The following image represents the Apollo 17 site observed from the initial orbit, at an altitude of 50km. We can guess the position of the LM (Lunar Module) thanks to its elongated shadow, while other footprints or rovers are not noticeable. The LRO control team decided to reduce the altitude of the orbit to 21 km in order to increase the accuracy of the images. This time, on the images below captured from the sites of Apollo 12 and 17, many traces of the passage of these missions are perfectly visible. One distinguishes notably the LM named Challenger (vehicle used by astronauts), the footprints of astronauts, and, for Apollo 17, the tracks of the lunar rover (LRV). The footprints of the astronauts are clearly visible, they are easily distinguished from the parallel tracks left by the lunar rover. On the following images of Apollo 12, we can compare the differences in perceptible details between the images captured at 50km and those captured at 21km altitude. These images are not very well known, but they are — in my opinion — very interesting. 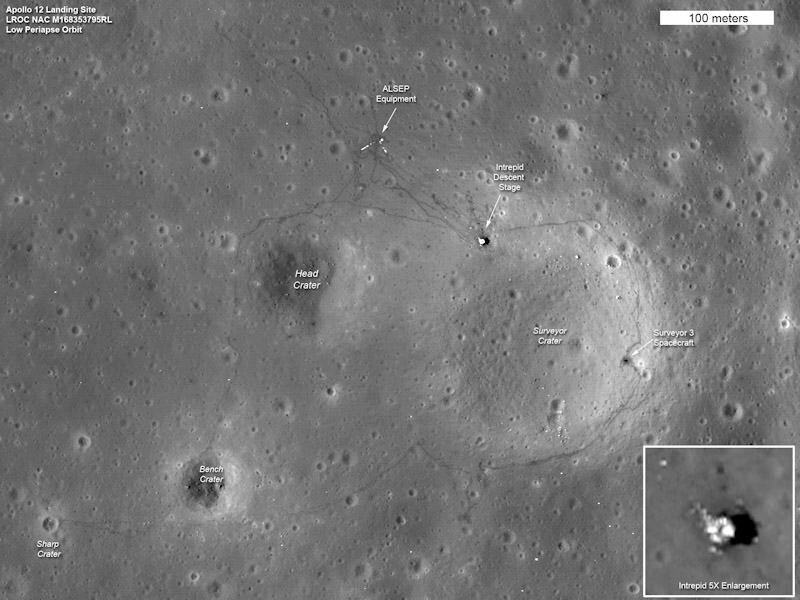 By visually showing the astronauts’ paths around the LM, these photos make these missions more concrete and, as NASA hoped, increases the confidence of the general public in the true existence of the Apollo missions on the Moon.